Please meet one of the salads constantly making an appearance on my clients menus all summer long: Stone Fruit & Burrata Salad. Now, I’m not going to claim that this is an original recipe of mine in any shape or form. 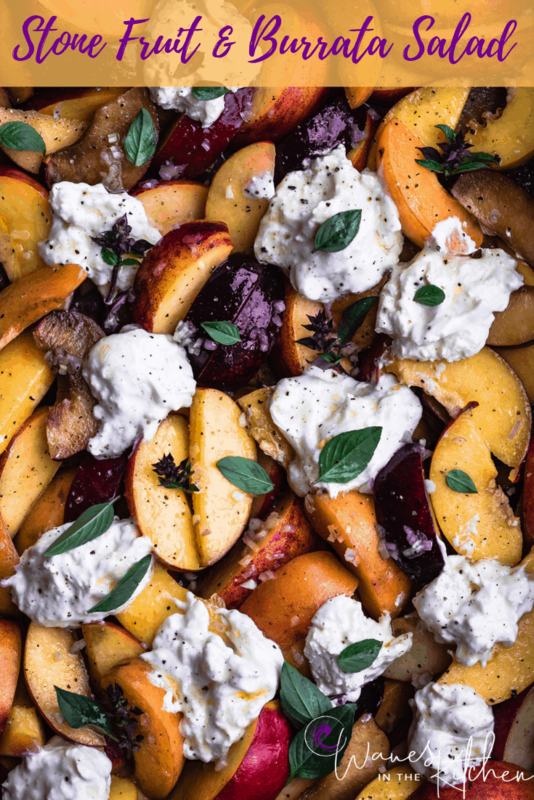 It’s literally a two-ingredient salad: stone fruit & burrata. You can easily find versions of this all over the internet and in countless cookbooks, but I’ve had so many clients ask me for the recipe that I decided to share my version. Being that’s it’s a two ingredient salad (stone fruit and burrata), make sure you get the very best stone fruit and the very best burrata that you can. And just in case there’s any confusion, stone fruit is a fruit with a large “stone” (pit) inside. This includes peaches, plums, nectarines, apricots, pluots, lychees, mangoes, cherries, and more. For this salad I’ve always kept it to the peach, plum, nectarine, apricot variety plus all the hybrids in between, with new ones seemingly popping up every day (like pluots). But feel free to experiment with any sort of stone fruit that I have not yet…and let me know how it goes! For another delicious summer variation, add heirloom or cherry tomatoes. I did just that for my clients last week and they fell in love. A balsamic drizzle is typically balsamic vinegar and sugar that’s been cooked over heat and reduced by half into a glaze. Make your own or buy, as there are some really good store-bought ones on the market. I’m really into adding shallots to my dressing. I consider them the magic ingredient, as they seem to really take simple vinaigrette up a level. And now that you have all the ingredients, let me walk ya through just how easy this salad is: cut fruit, whisk dressing ingredients together, toss fruit with said dressing, put on a platter, scatter burrata on top, (artistically place basil on top (optional), and drizzle all with balsamic glaze. Pretty sure it’s as easy as it gets and if you can read this me thinks you can make the salad. Have ya tried this recipe? I’d love to hear about it and see it too! Please leave a comment below and take a pic and tag it on Instagram with #wavesinthekitchen. You can also follow me on Facebook, Instagram and Pinterest to see more colorfully delicious food and all sorts of awesome adventures! Let’s make waves in the kitchen! Whisk together all the vinaigrette ingredients. Toss cut stone fruit in a large bowl with the dressing (or toss it directly on the platter you will be serving in if you prefer). Arrange stone fruit on platter. Break apart balls of burrata and scatter on top of the fruit. Sprinkle with salad, pepper, and balsamic drizzle. If using store bought balsamic drizzle I recommend drizzling directly from the bottle over the salad. Daniela, your new site is so beautiful! Ah, I can’t get over it! Congrats and can’t wait to see more of what you roll out! Thank ya so much Heidi!!! Was def a labor of love and very much a work in progress :). Really appreciate the feedback! So, so, so DELICIOUS and easy to make. Besides it looks SO pretty??? ?